Goods IN – Inventory control with batch numbers and expiry dates. Manage Recalls, Product Alerts, Expiry Items, Stock Adjustments / Bin. Sales & Distribution – Sales Orders, Invoices, Packing Slips, Picking Notes, Credit Notes, Labels etc. Multi Currency / Customise Reports. Export Module – including quotations, sales orders, export invoices etc. Manage drug quotes/invoices for local and export customers. Full sales and purchase analysis with price comparison features. Monthly medical product file updates from suppliers like Alliance Healthcare and AAH. Online Backup with secure data centre with ISO27001 certified company. Our objective is to manage our client’s compliance with GDP regulations. We achieve this by providing a complete solution to manage the wholesale operation of your pharmacy. Our Wholesale Software has been designed based on MHRA best practice requirements. The idea behind the Wholesale Software is to provide a robust application that our clients can utilise to demonstrate integrity, audit ability and evidential weight of their internal controls for the movement of pharmaceutical stock. By using the ATL Wholesale Software our clients are able to not only ensure they are compliant with the MHRA best practice guideline, but manage their business and compliance risk and identify flaws in their procedures by providing real-time audit reports of who did what and when. The application is designed to monitor the flow of pharmaceutical stock handled by the client from arrival to departure by keeping a full record of transactions. Handle stock with expiry dates, batch numbers and facilitate stock tracking. Reduce your paper work and increase your profit margins using our user friendly inventory management. Dashboard – view daily sales activities, inventory, invoices, payments and deliveries. Purchase history and price comparison reports for all your suppliers. Tracking items for data analysis from inventory to sales and returns. Stock Movement – stock handling, expiry dates, profit margin, buying history, sales history, comparison sales and purchases. The customer management module provides a full analysis and complete history for sales, quotations, invoices, payments, credit notes, delivery notes, picking notes and sales returns. The supplier management module provides a full analysis and complete history for invoices, payments and credit notes, enabling you to stay on top of payments and avoid losing any supplier discounts. Order scheduling so stock can be sourced from different suppliers using the purchase order module. Manage dead stock, sales returns, purchase returns, expired products and inter branch transfers etc. Preloaded drug database for medical products from UK suppliers. Maintaining the confidentiality, integrity and availability of our system and our client’s data is of paramount importance to us. Our application uses Microsoft Windows Platforms to stay secure. ATL constantly provides regular updates and annual declarations to the NHS Information Governance body which covers information security and data protection standards. The Wholesale application is cloud based and hosted on servers based at a UK fast data centre. The SLA provides 100% connectivity. The data centre facility holds ISO 27001 certification, the international information security management system standard, which means that the data managed by UK Fast on behalf of a company is operated in compliance with ISO 27001 when it comes to physical and logical security. Minimise risk and disruption, improve on stock level control by having a complete overview of your supply chain network from manufacturers and suppliers to storage and distribution. Provide suppliers visibility of inventory levels which includes forecast, usage, orders, shipments and receipts. Easy to generate sales orders, picking notes, invoices, packing slips, credit notes etc. Reduce costs by optimising inventory levels, enabling better operational planning and improved customer relationships. Pharmacy wholesalers or any GDP distributors. The software streamlines the wholesale warehouse operation and provides support in helping you to be MHRA compliant. The ATL Pharmacy Wholesale Software is a user friendly device which has been designed specifically for pharmacies to manage their entire wholesale operations. Software Installation for 2 PC’s with unlimited users. Full training will be provided prior to going live. Unlimited sessions can be booked for further training without any charge. Please complete the “Request A Demo” form and one of our Sales Consultants will contact you within 24 Hours. 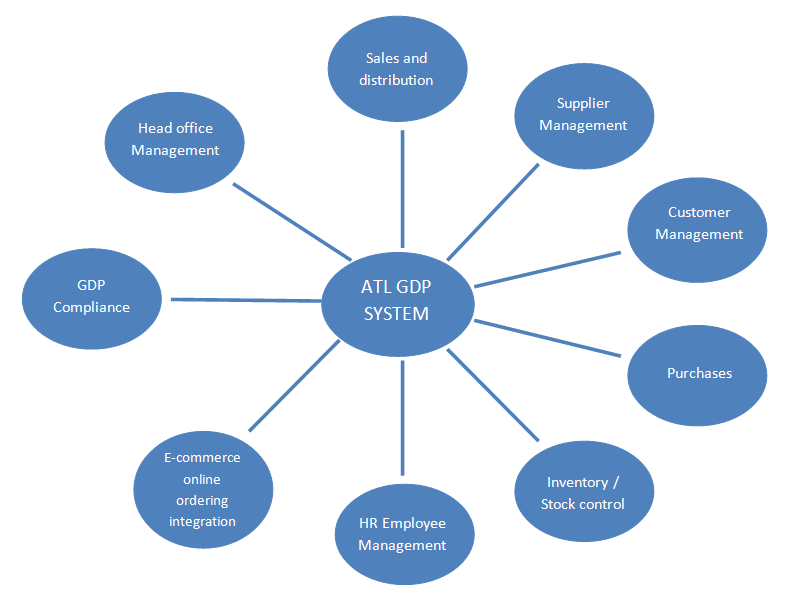 The ATL Wholesale application is based on Enterprise Resource Planning (ERP). ERP provides a process covering broad and deep operational end-to-end processes. The flexibility of this modular design ensures that the system will be able to accommodate future requirements as and when they arise. All the forms and Sop’s will be preloaded to manage your MHRA compliance and procedures on a regular basis. We will assist you in managing your wholesale operations and also help you to be fully compliant based on MHRA Guidelines.